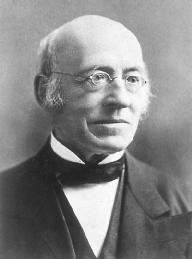 William Lloyd Garrison, publisher of the anti-slavery newspaper The Liberator and founder of the American Anti-Slavery Society, was one of the most fiery and outspoken abolitionists of the Civil War period. Garrison was born in Newburyport, Massachusetts, on December 10, 1805. In 1808, Garrison's father abandoned his family leaving them close to destitute. At age 13, after working at a number of jobs, Garrison became an apprentice to Ephraim Allen, editor of the Newbury-port Herald. Garrison later moved to Boston where he became editor of the National Philanthropist in 1828. At that time, Garrison became acquainted with the prominent Quaker Benjamin Lundy, editor of the Baltimore-based antislavery newspaper, the Genius of Universal Emancipation. In 1829, Garrison became co-editor of Lundy's publication and began his vigorous advocacy for abolishing Slavery. Shortly thereafter, Garrison was sued by a merchant engaged in the slave trade. He was convicted of libel and spent seven weeks in prison, an experience that strengthened his conviction that all slaves should be set free. After his release from jail in 1830, Garrison returned to Boston where he joined the American Colonization Society, an organization that promoted the idea that free blacks should emigrate to Africa. When it became clear that most members of the group did not support freeing slaves, but just wanted to reduce the number of free blacks in the United States, Garrison withdrew from membership. In January 1831, Garrison founded The Liberator, which he published for 35 years and which became the most famous antislavery newspaper of its era. Although he was a pacifist, Garrison struck a formidable stance in the very first issue in which he proclaimed, "I do not wish to think, or speak, or write, with moderation … I will not retreat a single inch—AND I WILL BE HEARD." The Liberator, which never had a paid circulation greater than three thousand became one of the most widely disseminated, consistent, and dominating voices of the Abolition movement. Antislavery advocates of the day, or abolitionists, were widely divergent in their views of how and when slavery should be ended and what should happen to freed slaves after emancipation. Garrison was part of a group which believed that abolition of slavery must happen as quickly as possible. Those who sought "immediatism," however were divided on how to achieve this goal. Garrison, though searing in his language and unyielding in his beliefs, believed only in civil disobedience, and opposed any method of active resistance. In 1832, Garrison founded the country's first immediatist organization, the New England Anti-Slavery Society. The following year, in 1833, he helped organize the American Anti-Slavery Society. He wrote the society's constitution and became its first corresponding secretary. He befriended fellow abolitionist and writer Frederick Douglass, and made him an agent of the Anti-Slavery Society. Over the next several years Garrison came to reject the teachings of established churches and the government of the United States, which he viewed as supporting slavery. Increasingly hewing to a philosophy of moral absolutism, Garrison embraced not only the cause of nonviolent resistance, but temperance, Women's Rights, and Christian perfectionism. In 1840, Garrison's views precipitated a split in the Anti-Slavery Society between the minority who supported his radical beliefs and the majority who disapproved of his views regarding religion, government, and the participation of women in the struggle for emancipation. When Garrison's supporters voted to admit women, a group seceded from the society and formed the rival American and Foreign Anti-Slavery Society. Another group, interested in continuing to seek reform through political activity, later left to start the Liberty party. Over the next two decades, Garrison's influence declined as his radicalism became more pronounced. In the 1850s, The Liberator hailed John Brown's raid on Harpers Ferry while denouncing the Compromise of 1850, the Kansas-Nebraska Act, and the U.S. Supreme Court's decision in Dred Scott v. Sandford. He continued to support secession of the anti-slavery states and publicly burned a copy of the U.S. Constitution at an abolitionist rally in 1854. "I do not wish to think, or speak, or write, with moderation…. I am in earnest—I will not equivocate—I will not excuse—I will not retreat a single inch—and I will be heard." After the Civil War began, Garrison put aside his Pacifism to support President Abraham Lincoln and the Union Army. He welcomed the Emancipation Proclamation and the passing of the Thirteenth Amendment, which outlawed slavery. In 1865, Garrison published the last issue of The Liberator, although he continued to advocate for women's rights, temperance, and pacifism. Garrison died on May 24, 1879, in New York City. Cain, William E., ed. 1995. William Lloyd Garrison and the Fight Against Slavery: Selections from the Liberator. Boston: Bedford Books. Mayer, Henry. 1998. All on Fire: William Lloyd Garrison and the Abolition of Slavery. New York: St. Martin's Press.